MULTICAM: Heavy lifting is done! 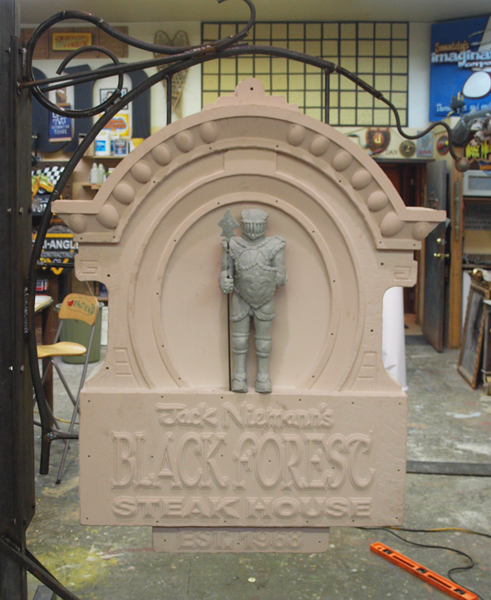 Today the cut steel plates were finally ready and work could begin on the Black Forest sign once more. I fired up the hydraulic bender and bent up the heavy 1.125" thick steel rod for the primary support on the bracket. The smaller curl is 1" solid steel. Kirsten gave me a hand steadying things while I welded everything securely in place. A temporary stand was also welded up to hold the sign securely while we work on it and for transport to the site. My good neighbor Gord came over to give us a hand as we wrestled it over to the lifting beam and hooked up the chain-fall. It went easier from that point as it did the heavy lifting with little effort. Now that is able to be worked on all around progress will go much smoother and quickly too. The second knight needs only helmet to be finished. There is a little more sculpting to finish and then we are on to paint at last.